Our boutique camping options for 2019 are now open for bookings. The boutique camping area is approximately a 15 minute walk from the festival village and has it’s own toilets and shower block. There is also a communal pamper tent with hairdryers, straighteners and phone charging capabilities (please make sure that you bring your own charger). Boutique camping accommodation is not included as part of the festival ticket price and must be purchased separately through the various suppliers. Tangerine Fields are back, offering pre-pitched 2, 4, 6 and 8 man tents as well as unique boutique accommodations Geo Domes, Bedouin Tents, Bell Tents and Chill Out Hammock Tents. And new for this year they have a tent with blackout bedroom technology that allows for a longer more restful sleep. Visit Tangerine Fields for more information and pricing. 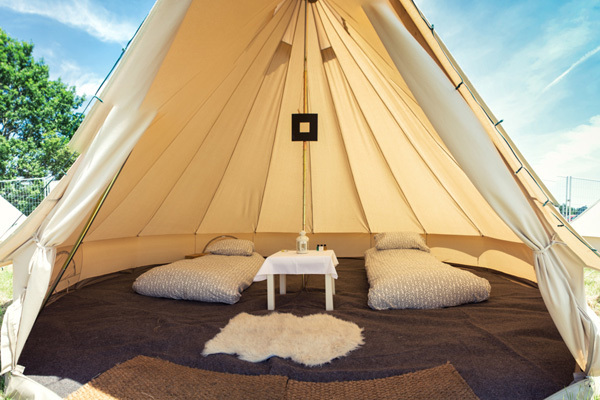 Honeybells offer luxury Bell tents for 2, 4 or 6 people and Emperor tents for 6 or 8 people that can be kitted out with a range of furnishing options. In addition to this, campers staying in the boutique camping area will also have access to the Honeybells pamper tents, which include a chill out area, phone charging facilities, mirrors, hairdryers and lamps. Visit Honeybells for more information and pricing. Green Yurts return to End of the Road this year, with luxury yurts ranging from 10ft – 16ft with all the trimmings you need including a lockable door, groundsheet, carpeted floor, rugs, bedding, cushions, tables, throws, a mirror, shelving, lighting… and the kitchen sink. Visit Green Yurts for more information and pricing.